What makes Core Physical Therapy special is the people. We treat everyone in our practice with the care and respect that a family member would deserve. This personalized, hands-on care has allowed us to have the reputation as the premier rehabilitation center in Downtown Seattle. If you either work or live in Downtown Seattle, we offer 4 convenient locations staffed with clinically experienced therapists providing quality care using evidence-based practice. Over 100 doctors refer their patients and families to us for treatment. Our therapists understand that to best treat the needs of our patients, specialization is necessary. We believe that a synthesis of modern technique and human touch produces optimal results. Our approach is based on the interconnectedness of every system in the body and how those systems are influenced by external factors such as environment, work and activities. Patients in our practice become an expert in the management of their condition by the time of discharge. We pride ourselves in our ability to educate as well as treat. Our patients respond well to our attentive, safe and positive environment. At Core Physical Therapy, we are 100% committed to patient care. One on one treatment only. 30 to 60 minute treatment sessions. 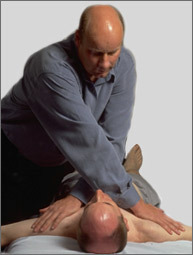 Massage: Swedish, Cross Friction, Acupressure, Lymphdrainage, Shiatsu, MFR. Soft Tissue Mobilization: contract/relax, strain/counter strain, myofascial release, stretching, neurovascular mobilization. Joint Mobilization: European, Australian and North American philosophies. Exercise Prescription/Progression: Home and clinical exercise programs are based on a functional and dynamic approach, which have immediate carry over to your sports and activities of daily living. For our professional and high level athletes, we provide full gym access within their rehabilitation. Orthotics: Custom fitted orthotics (shoe insoles for bone structure mechanic support) for work-related or sports activities. Thermal Ultrasound- Continuous sound waves absorbed by the body that can reduce or control pain & muscle spasms, increase circulation and soft tissue flexibility. Non-thermal Ultrasound- Pulsed sound waves absorbed by the body to accelerate tissue healing, and promote the reduction of tissue inflammation. Phonophoresis- Localized delivery of medication into the body through the skin by using ultrasound. Transcutaneous Electric Nerve Stimulation (TENS)- Mild electrical current in low frequencies applied to relieve stiffness and pain. Neuromuscular Electric Stimulation/Russian Stimulation- Medium to high electric currents used to activate specific muscle groups. Microcurrent Electric Stimulation- Low level current used to relieve pain, increase wound healing and regeneration of tissue. Iontophoresis– Localized delivery of medication into the body through the skin by using electric current. Biofeedback/Surface EMG- Measures muscle activity both at rest and while contracting through electrodes placed on the skin. Kinesio Tape- Elastic, latex-free tape lasting 3-5 days that may re-educate the neuromuscular system, reduce pain, promote healing, promote lymph flow and decrease swelling.